First up this week is this perfectly balanced Butternut Squash, Chilli and Coconut Milk Soup from Easy Peasy Foodie. Just the thought of the flavours of this soup make my mouth water. The butternut squash and chilli go so well together and the chilli gives it a good kick. But then the creamy coconut milk will calm down the fiery chilli to create a sweet, warming, creamy soup. This is a definite must make soup! Next up are these Honey Sriracha Chicken Wings from The Not So Creative Cook. I will admit that when I saw two recipes from The Not So Creative Cook that used Sriracha sauce I did have to look on the internet and investigate what this sauce was. If you do not know, Sriracha is a hot, spicy chilli sauce that is made from chilli paste, distilled vinegar, garlic, sugar and salt. Since seeing these delicious chicken wings I will be keeping an eye out for sriracha sauce when I do my shopping! Next is this healthy Honey, Ginger, Pumpkin Seed and Walnut Crusted Salmon with Black Rice Soba Noodles from Nutritious Deliciousness. I love salmon, but my hubby will only eat it if it is pan fried or has a crispy topping like this one. Therefore it has to go on my must cook list. I love adding seeds to meals and I can imagine how perfect the seeds and flavours go together with the salmon! Finally are these homemade Honey Roasted Cashew Nuts from Searching for Spice. I love to sit and nibble on honey roasted nuts, but the mass produced ones are not great for you and do contain a lot of salt. But if you can make them at home you can control the amounts of honey and salt that you add. I have never thought of roasting my own nuts but after reading this recipe I will be giving it a go! 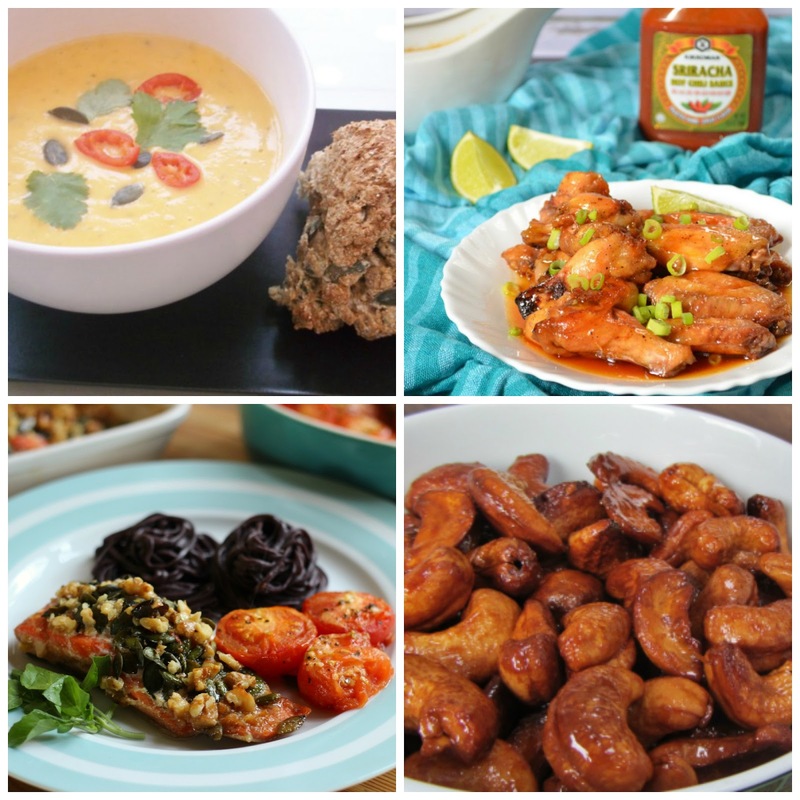 Thank you to everyone who joined in with week 19 of CookBlogShare. It is great to see so many of you regularly joining in and it is also great to welcome new bloggers who are new to the linky. I hope to see all of you back again this week. CookBlogShare linky will return to Hijacked By Twins tomorrow and I cannot wait to see what you have been cooking up!